Weetwood Hall is set within 9 acres of stunning gardens and Leeds/Bradford Airport is only 4 miles away with easy access from the M1, M62, M61 and A1 motorways. The fantastic facilities at Esporta include an indoor swimming pool, sauna, steam room and beauty spa (charges apply). The Woodlands Restaurant serves a menu bursting with traditional Yorkshire and continental dishes. The Brassiere, serving light meals in a contemporary and relaxing surroundings and features an adjoining Conservatory leading out on to Weetwood Hall's Italian Gardens. Alternatively, guests can dine in the Stables Pub. 24 hour room service also available. The fantastic facilities at Esporta include an indoor swimming pool, sauna, steam room and beauty spa (charges apply). 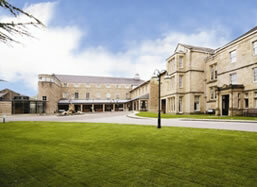 Just one of the many Hotels near Leeds/Bradford Airport available from FHR. By A1 - Follow the signs to Leeds / Bradford Airport into Leeds on either A63, A58 or A61. When you reach the A6120 ring road follow the signs for Leeds / Bradford Airport. Weetwood Hall is on the left opposite Weetwood Police Station immediately prior to the roundabout. By M62 West - Leave at J27 onto M621 then leave at J3 City Centre - follow signs for 'All Loop Traffic'. Keep on the loop until you see signs for Leeds University / A660. Continue past University for 3 miles, Weetwood Hall in on right before a large roundabout opposite Lawnswood School. By M62 East - Leave at J29 onto M1 (north / Leeds City Centre) - follow signs for 'All Loop Traffic'. Keep on the loop until you see signs for Leeds University / A660. Continue past University for 3 miles, Weetwood Hall in on right before a large roundabout opposite Lawnswood School. By M1 - M1 Leave at J43 for M621 then leave J3 for City Centre - follow signs for 'All Loop Traffic'. Keep on the loop until you see signs for Leeds University / A660. Continue past University for 3 miles, Weetwood Hall in on right before a large roundabout opposite Lawnswood School. View all Leeds Bradford Airport Hotel options available from FHR.